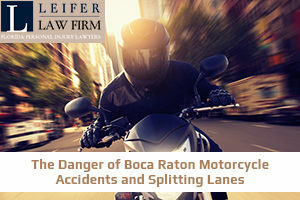 One of the most common types of moves that can lead to motorcycle accidents is known as splitting lanes, which occurs when a motorcycle weaves in and out of lanes in traffic. Some states prohibit this practice, while other states such as California never passed a law prohibiting this maneuver, but also never expressly approved of it. That recently changed when the governor of California passed a bill that made the state the first to legalize lane splitting for motorcycles. Motorcyclists in California hailed the bill, because they believe it will make them safer, and raise awareness amongst car drivers that motorcycle riders have a legal right to not only share the road, but to change lanes safely whenever the need occurs. For many drivers, however, motorcyclists that split lanes are a hazard on the road and a big contributor to motorcycle accidents. The biggest reason cited is that many riders will weave between lanes without warning, giving the drivers of vehicles precious little time to react. As a result, the driver of a vehicle who applies the brakes to avoid hitting a motorcyclist who has just split a lane may cause a rear-end accident. In some instances, the driver may actually clip the motorcycle that is making the lane change, causing an accident. However, the key to safe lane splitting lies in the speed at which a motorcyclist makes the move. In fact, an early version of the California law that recently passed required motorcyclists to be traveling slower than 30 miles per hour when they split lanes. But the final version of the bill did not contain a miles-per-hour restriction. That’s because the state felt the restriction needed more study, so as of now motorcyclists are only required to use safety and care when splitting lanes. The bigger issue is that drivers of passenger vehicles must change their negative mindset regarding the presence of motorcycles, in order for harmony to exist on the road. The injuries suffered after motorcycle accidents are usually much more severe than if you were in a passenger vehicle, because you are much more exposed on a motorcycle. If a car hit you while you were making a safe lane change, you may be entitled to compensation for your injuries and your pain and suffering. At Leifer Law, we have the resources and the experience to help you through this difficult time. Please call us today at 561-660-9421 for a free legal consultation.